Keana Nadeshiko Sheet Masks are made with 100% Japanese-made rice serum to correct pores that appear large due to dehydration. These deeply hydrating masks leave your skin feeling as soft and plump as a freshly made bowl of rice. 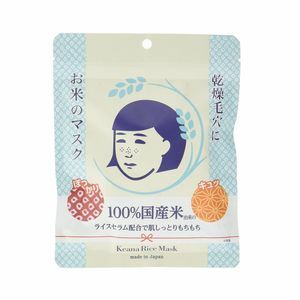 Keana Nadeshiko Rice Mask sheet masks are thick and drenched in serum for a close and comfortable fit to the face. For plump skin with a soft and poreless texture. Keana Nadeshiko's unique rice serum is made from 100% Japanese grown rice that turns rough, dry skin plump and soft. Fermented rice lotion hydrates the skin, while rice bran oil improves elasticity. Rice-derived ceramides improve the health of the skin while rice bran extract improves its texture. Use immediately after washing the face, or after prepping the skin with a hydrating lotion. With clean hands, carefully take the mask out of its packaging and unfold, being sure to avoid ripping or pulling. First fit the sheet to the eye area, then the mouth, and then smooth the sheet over the face. Leave for five minutes and then gently peel away. Gently massage in any serum that remains on the skin. These sheets masks are great as part of your everyday skincare routine, or as a special treatment whenever your skin needs concentrated care. Looking for the best deals for Keana Nadeshiko Sheet Masks? Be sure to put this into your wishlist by logging in, or sign up today to enjoy a 500 point discount you can use right away! Wonect offers FREE deliveries worldwide and has daily deals, so do check back for the best prices from Japan!